There are music festivals planned all across the country this summer (and with good reason). There’s nothing quite like spending a weekend with your friends in the outdoors, making memories and experiencing some of the best live musical performances of our time. Your tickets are purchased, your crew is on board and excitement levels are through the roof. Now what? If you’re not properly prepared this can easily turn from one of the best weekends ever to the worst, so do your research, make a list, check it twice and get camping! Remember, all music festivals have their own rules on what they do and do not accept. Make sure you check the FAQs and camping information, then plan accordingly. 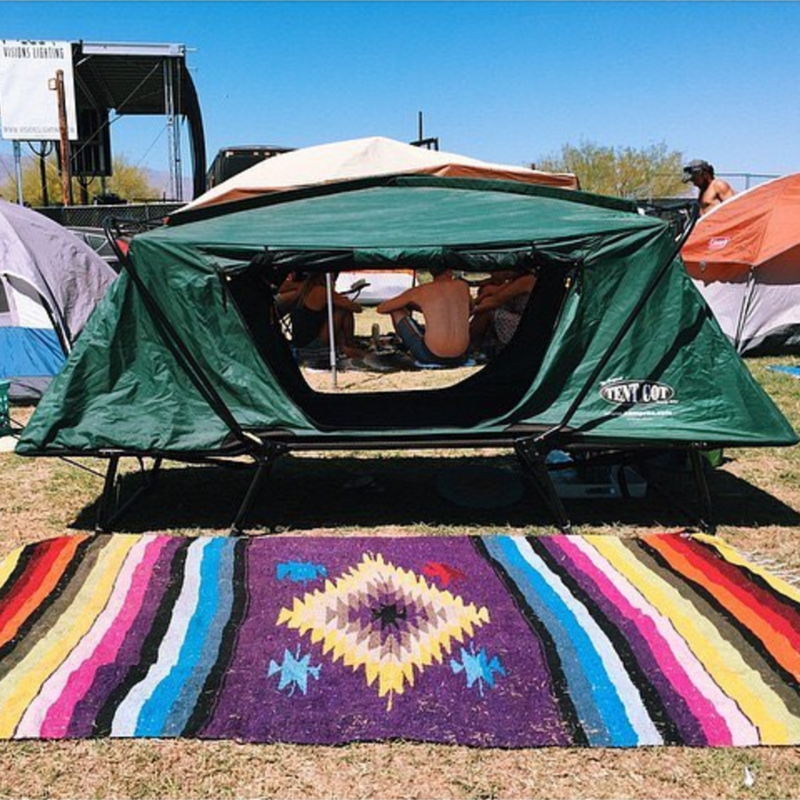 A quality tent is a must have at a music festival. Our tent cots are lifted eleven inches off the ground and have no-see-um mesh on all windows and doors These details will keep you cool enough to get some sleep in the mornings. Each tent cot also comes with a rain fly which will protect you from or unexpected periods of rain. In addition to your tent cot, you’re definitely going to want a sleeping pad. A sleeping pad will ensure that you feel like you’re sleeping at home and not outside. Comfort is key when you’re spending hours outside living it up! Depending on the location of your music festival and the climate of that region, you’re going to want to pack clothes for every type of unexpected weather. Think layers, long sleeves, and jackets for night time or unexpected storms and tanks, tees and shorts for heat waves. In terms of shoes, you definitely want something comfortable since you’re going to be on your feet for long hours. You can never go wrong with a good pair of Converse or Adidas. Pro-Tip: make sure to bring rubber flip-flops for the communal showers! Water – make sure to bring enough water to stay hydrated for multiple days. Dehydration is no joke! Light – Festivals are usually in remote areas, and light won’t be abundant at night. You’ll definitely want to bring a flashlight or keychain flashlight to help with trips to the bathroom. In addition, a lantern or portable light is useful to have at your campsite. Portable chargers – With crowds of thousands of people, it’s easy to get lost or separated from your crew. Make sure to bring a portable charger with you so you’re always a call or text away from whoever you’re with. Sunscreen, hand sanitizer, and wipes – The three musketeers of campsite necessities. Protect yourself from the sun, germs and keep your space and self-sanitary.